Is oil spill 'Obama's Katrina'? 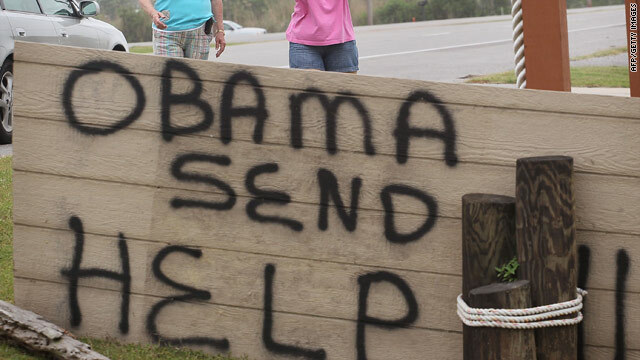 A message to President Obama in Venice, Louisiana, during his visit Sunday. Washington (CNN) -- From the oil slick in the Gulf of Mexico to Washington, critics charge that the Obama administration didn't act fast enough after the April 20 oil rig explosion and subsequent spill. Conservative radio talk show host Rush Limbaugh called the incident "Obama's Hurricane Katrina." A Palm Beach Post editorial stated that Obama "acted way too much like George Bush after Katrina." A Washington Examiner headline read: "Gulf oil spill becoming Obama's Katrina: A timeline of presidential delay." No, says Douglas Brinkley, a presidential historian who was in New Orleans, Louisiana, during Hurricane Katrina in 2005. "There's no comparison whatsoever between them," he said. "This was a corporate bungle" by BP, which owns the rig and is ultimately responsible for the cleanup efforts. "But the Obama administration has done nothing wrong," he added. "This has been BP not having a plan A or plan B or plan C or plan D for capping this. They are winging it." Jeff Wise, an expert on disasters, said the administration has every right to blame BP -- and in a crisis, many look to government for answers. "People want government to handle every single crisis as it happens," he said. "But what we see when a large bureaucracy is involved, it can be very difficult to figure out what needs to be done and how to mobilize the necessary resources. " Wise, author of the book "Extreme Fear," which looks at how people react to emergency situations, said that unlike naturally occurring events such as Hurricane Katrina, the oil spill was something unforeseen and a never-before-happened moment. "When something happens that you don't expect, you haven't done any of the thinking through of what could happen and what could be the outcome and what you should be looking for," he said. "So you're in a poor position to respond." Brinkley said that any comparison to Katrina minimizes the human devastation that occurred. Video: Is oil spill President Obama's Katrina? "The human tragedy here is the 11 people blown up in the oil rig. With Katrina, you're dealing with almost 2,000 deaths in an entire region that's been flattened like a nuclear bomb had gone off," he said. "I don't see any big comparison. ... It seems to be a Republican talking point." The White House is pushing back against the criticism, adamant on distinguishing itself from the much-criticized efforts by Bush and his administration in the days after Katrina. When asked about the comparison, White House Press Secretary Robert Gibbs said Saturday that "other than geography, I can't figure out how." Obama also addressed concerns over the administration's response, saying Sunday in Louisiana that "from day one, we have prepared and planned for the worst even as we hope for the best." He added, "We will spare no resource to clean up whatever damage is caused." Some New Orleans residents see both sides of the argument. "This is a completely different disaster that you can't even compare," one told CNN affiliate WGNO. Another man who was in New Orleans for Katrina said both presidents "acted a bit slowly." It's not just the Obama administration facing the heat; Louisiana State Rep. Juan LaFonta, a Democrat, took aim at Republican Gov. Bobby Jindal. "Having lived through Katrina and studied the government's slow response in that instance, this is a Katrina-like disaster in the making," he said. "Because of Gov. Jindal's slow response, we are now behind the curve. State and federal officials are battling to catch up, but the damage may have been done in the early hours of the tragedy." Brinkley disagrees, saying it's disingenuous to take the burden of a company's oil spill and "try to place it on anybody, whether it's Bobby Jindal or [Mississippi Gov.] Haley Barbour." The oil rig exploded April 20. On April 21, the deputy secretary of the interior and the Coast Guard were dispatched to the region, and Obama was briefed on the situation. The initial response focused on the search for missing platform workers and putting out the blaze. Days later, the Coast Guard said that no oil was leaking from the well but revealed shortly after that oil was indeed seeping out. Efforts by the Coast Guard and other officials continued in the days following the explosion, though they were delayed at times by weather. The Department of Homeland Security designated the spill as of national significance April 29. That same day, a Coast Guard official referred to BP as a partner in the crisis but then corrected herself. One Republican lawmaker focused the criticism on the administration's relief effort timeline. "This incident occurred on April the 20th," said Rep. Mike Pence, R-Indiana. "It really wasn't until April the 28th until the administration fully deployed federal resources." Obama headed to the region Sunday, 11 days after the explosion. Bush has been heavily criticized for his administration's efforts in dealing with the 2005 hurricane. Then-Rep. Nancy Pelosi, D-California, said the administration was "oblivious" and "in denial." On August 27, two days before Katrina hit the Gulf Coast. Bush declared a state of emergency for Louisiana, which then authorized the Department of Homeland Security and the Federal Emergency Management Agency to coordinate relief efforts. He discussed the storm from his ranch in Crawford, Texas, on August 28, though critics pointed out that his statement was extremely short, and the bulk of it was dedicated to Iraq. He said the government would do "everything in our power" to help states affected by the hurricane. Katrina made landfall the following day. On August 31, Bush made the now-infamous flyover of New Orleans on his trip back to Washington. The move drew criticism because he did not land and meet with state and local officials. But the administration hit back, saying he didn't want to take away vital resources from officials on the ground. Those on the ground told a different story. Louisiana Gov. Kathleen Blanco, New Orleans Mayor Ray Nagin and others demanded help and said the federal government was not doing enough. That sentiment was echoed by people wandering New Orleans in search of water and shelter. Some who sought refuge in the cramped, dingy convention center said help was not coming fast enough. Others questioned whether the government would help at all. On September 2 -- four days after Katrina hit -- Bush traveled to the region, stopping in Alabama and later in New Orleans. CNN "American Morning" Correspondent Jim Acosta contributed to this report.